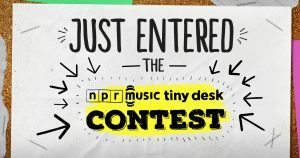 Check out our Tiny Desk Contest video! Check Out Our PortlandNotes.com interview! We were very pleased and honored to be invited to do an interview for the local music website PortlandNotes.com. 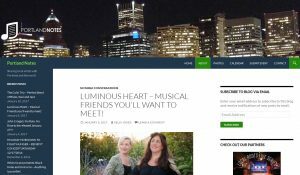 New Year Update…Local Roots Live Series, The HeartCore and more! We know what you’re thinking…things have been quiet in LH land, especially when you consider how busy we were in November! But have no fears, we have not forsaken all of our fans; we have been busy doing some behind the scenes work. We’ve been polishing some of our older songs, sprucing up the arrangements and/or adding new instruments, writing a few more new songs and getting those ready to perform, project planning, business meetings and more. Our show schedule in the coming months is intentionally more sparse, as we soak in the dark, thoughtful, and creative time of the year. We have a couple of big projects that we are starting, (now, now, we aren’t going to spill the beans just yet) so that will take some of our energy. But primarily, our plans are to spend plenty of time writing and perfecting new material, so we can emerge, come springtime, with a sparkly new set of songs for you all, dear ones! We are excited and can’t wait for you all to see what we have in store. We are so grateful for all of your love and support in 2016. Many of you contributed to our fundraiser, bought our EP, listened to our music on spotify, and have come to multiple shows. We are in awe of you, and could not have come so far without you all by our side! So, we decided to come up with a name for our lovely community; The HeartCore! And you are all members! Thank you, thank you for staying with us! The last little bit of news is quite possibly the most exciting of all! Luminous Heart has been invited to play the Local Roots Live Series at the Alberta St. Pub in Portland! 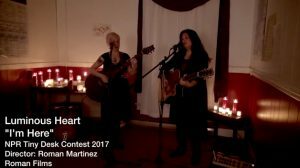 Each month, the “series showcase(s) some of the regions best musicians performing their music live and being recorded for later broadcast on the ‘Local Roots’ radio show”. (https://www.facebook.com/localrootsmusicnw/) on http://kmuz.org/! So if you can’t make the show, you’ll be able to hear the live recording on the radio (we’ll keep you posted on when). But if you’re free this Wednesday evening, come see us, as well as a few other great bands. Well, that about does it for this update. We hope you all had a great holiday season and look forward to seeing you soon! Wow… it’s been about 6 weeks since we released our debut EP Possibility, and we have been very busy! We’ve played a lot of shows, including several showcases at the FAR-West conference in Bellevue, WA, and we already have some dates booked for 2017! In addition, we’re getting low enough on copies of our new CD that we’ll be producing more in the new year! If you’re on Amazon, iTunes, Spotify, or other online music services, please look us up, give us a review or consider making a playlist based on our music… every little bit helps get our music out there to a wider audience! We have some exciting news about a local project we’re working on… stay tuned for an announcement coming in a few weeks, or join our mailing list to get all of our news first. And if you’d like to come say hi in person, we’ll be playing in Carlton at Troon Tasting Room this coming Saturday (Thanksgiving weekend in wine country!) from 2-4pm, and then next month at Eagle’s Nest Artisan Studio in McMinnville on 12/17 (your one chance to hear us sing some holiday tunes), and closing out the year back at Studio 154 /Independence Grill in Independence. (See our shows page for more details.) Hope to see you at a show! Listen to KMUZ.org tonight from 7-9pm! Our first radio play will happen tonight sometime between 7-9pm. Tune in to the Local Roots radio program with Robert Richter on KMUZ.org… we can’t wait to see which song will be played!